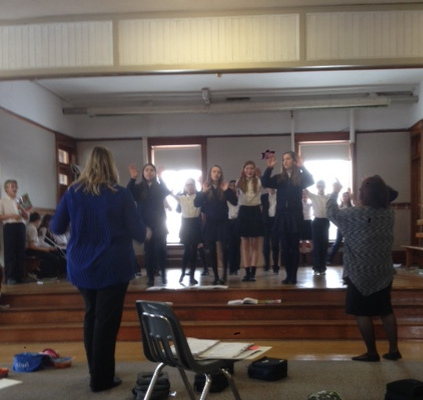 The school musical rehearsals are underway! Come see the performance of Once on This Island, Jr. May 4th at the Winnipeg Art Gallery. Tickets will be available in the school office. Notification will be posted. The students returned to school on January 5th, and immediately on January 7th, all of the Grades 3-8 students went on a field trip to MTYP for a performance of Black Violin. 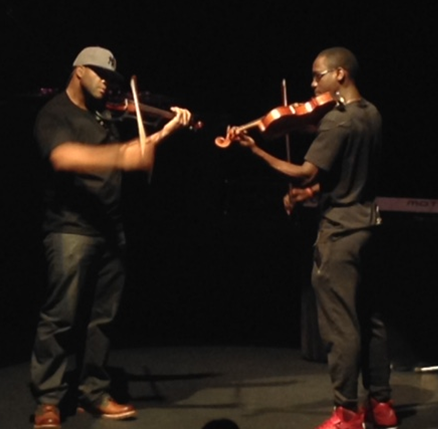 Kev Marcus and Wil B, aka Black Violin. This classically trained hiphop duo from Florida played primarily violin during the performance, but at times switched to playing keyboard and singing. The students were surprised when they entered the theater, to be told by the violinists that this was NOT a concert, but a party at which everyone was invited to dance and interact. Our students didn’t need a second invitation, and soon the entire group was moving to the beat, one way or another. SCCS students enjoying the party! The students returned to school and wrote about the experience, including warm notes of thanks and appreciation to the Board of Directors (Robyn Powell, Chair) for having provided them this incredible opportunity. 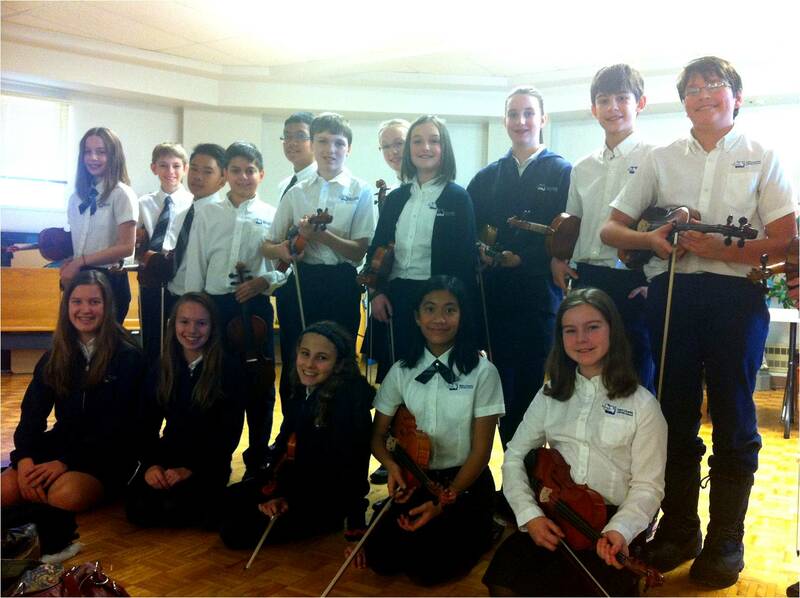 On Thursday, November 20th, the SCCS Violin Ambassadors took the “show on the road” for their first full-length concert of the year. Every year in November, the VAs travel to a church in East Kildonan to perform for the crew that makes perogies as a fundraiser for the Church. These hearty parishioners began their perogy making duties at 6:00 AM that morning and were just thrilled to have our students play a variety of tunes during their mid-morning break! Once the students finished performing crowd favorites such as “Merry Widow Waltz”, “Long, Long Ago”, “Hungarian Dance #5”, and the “Blue Bells of Scotland”, they shifted into a set of Christmas carols including “Rudolf the Red-Nosed Reindeer” and “Huron Carol”. Some audience members were so caught up in the moment that they swung into a waltz pattern – right there in the middle of the auditorium while the students were playing! The performance ended with a rousing rendition of “We Wish You a Merry Christmas”, which summed up the positive vibe in the auditorium perfectly. The students were treated to a lovely luncheon, and then they were invited to learn to make perogies alongside the pros. Soon after, the students boarded the bus carrying samples of HE perogies which were very much appreciated by the students and their families. We look forward to visiting you again in 2015! But before then, we have a year’s worth of performances to experience. Hope you can join us at one of them!